NASA and the National Snow and Ice Data Center (NSIDC) announced on Aug. 27, 2012, that the ice cap covering the Arctic Ocean is now smaller than ever recorded since consistent satellite measurements of the ice began more than three decades ago. Each year, the ice cap goes through a shrink-and-swell cycle, melting throughout the summer months before expanding through fall and winter. In the past decade in particular the minimum summertime extent of the ice cap has shown a consistent decline in size – a trend closely linked with the Arctic's warming climate. 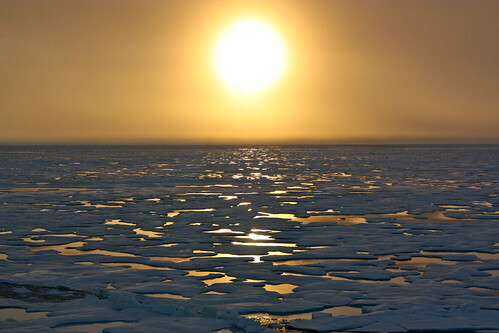 NASA and NSIDC scientists said the extent of Arctic sea ice on Aug. 26 surpassed the previous record minimum extent set in the summer of 2007. The ice cap will continue to melt and get smaller in the coming weeks before temperatures get colder and ice begins to refreeze as fall approaches. 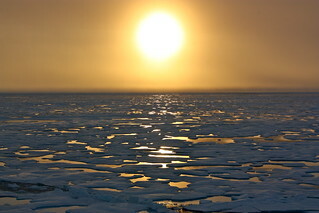 Caption: Sunsets started to tease the Arctic horizon as scientists on board the U.S. Coast Guard Cutter Healy headed south in the Chukchi Sea during the final days collecting ocean data for the 2011 ICESCAPE mission.